Oliver Goldsmith, by John Henry Foley (1818-1874), R. A. 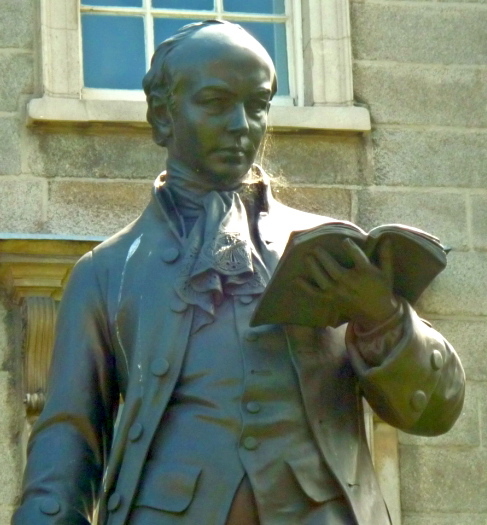 The novelist, poet and playwright Oliver Goldsmith, seen here holding an open book and a pencil, is one of two "elegant" bronze statues on the lawns outside the main entrance of Trinity College, Dublin (Casey 391). The openwork on the neckerchief is particularly fine. 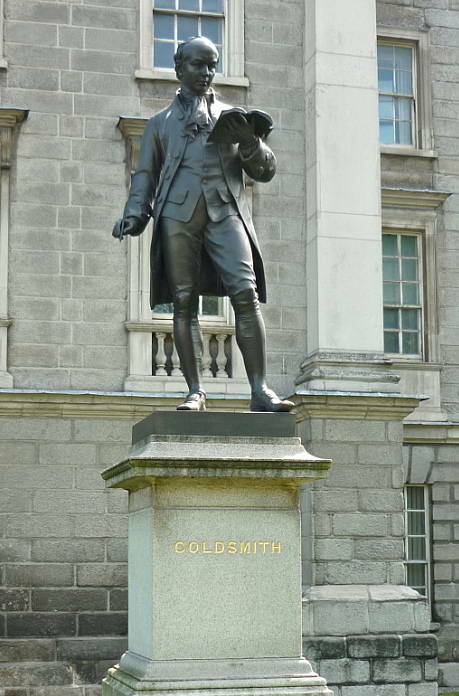 Goldsmith is to the right of the entrance, and on the lawn to the left stands the figure of another important alumnus, also by Foley: Edmund Burke. Benedict Read writes that the universities "were prominent institutions in the patronage of sculptures. This could be simply a matter of placing a professor on record with a bust, or it could be a more substantial simulacrum of a noted alumnus or official" (123). Other fine sculptures grace the grounds, including (from a rather later period), Goscombe John's memorial to William Lecky, MP looking across the College's Parliament Square.